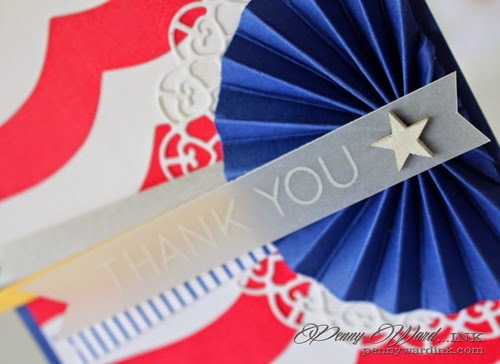 The Design Team over at Words 2 Scrap By wanted to honor our brave men and women, so we are participating in the Memorial Day Blog Hop at Operation Write Home. The theme is Red, White and Blue and I chose to use Sketch #254 from OWH for my card. I used my Silhouette Cameo to make the red & white "stripes". My favorite doily was die cut, then I made a Rosette from Navy blue card stock and cut in half. Small strips of silver, gold, and stripes were placed beneath the Rosette. Sentiment was stamped with StazOn Cotton White onto Vellum. Many thanks to our Heros who never returned home. Because of you, we still live in the Land of the Free. Penny, This is stunning! Love the background effect you achieved. Thanks so much for all you've done for OWH over the years, including joining along in our Words 2 Scrap By stop on the hop. Stunning is right! Love your bold and graphic design! Great card. Love the use of the rosette and that doily is gorgeous! Gorgeous card as always Penny! Love the red and white waves that you created for your background! Love that sketch! Love the boldness in this Penny and the use of the vellum too. Vellum can be trick to incorporate well. You always do such great work and I am so grateful that I 'met' you through OWH. Love the rosette & your beautiful "stripes", Penny! Did you see the sketch I used was from one of your cards? Thanks for the inspiration & enjoy the weekend! Stunning card - the wavy background really caught my eye. Love the vellum for the sentiment banner. Wow! This card is just gorgeous!! Thank you so much for sharing. I like the "ripple effect" of the red and white stripes! Such a great clean and simple card! Love the way you combined the patriotic colors! What an awesome card, I love the different banners especially the vellum. Everyone posting rosettes is making me want to create some! :) :) :) I think I know what my next AnyHero batch will be. Thanks for inspiring me! Penny- thanks for always inspiring me! Your cards always look like they are for a high end boutique- great design an perfect execution! This card is no different than all the others I have drooled over- simply gorgeous! Stunning card! Love all the details on this one! Hi Penny! When I saw your card it reminded me of the red, white & blue bunting people hang from their porches on patriotic holidays! I love the doily behind the rosette--it really softens it. So many yummy details; great job! Thanks for all you have done for our heroes; let's all stay in touch! Beautiful card Penny! I love the design and how you've stamped the sentiment on vellum! So many great details on your fabulous card. The background reminds me of Old Glory waving ! Penny this is darling! Love the wavy red stripes and your beautiful medallion ! Gorgeous card Penny! I love that rosette! Perfect for a hero card! Thanks for supporting OWH. Have a great day. I love love love love this card! The stripes are beautiful, the blue rosette with the white edge is gorgeous and the vellum sentiment is all you need to complete this card. So pretty! Love how you created the pendant - i haven't made one of those in a long, long time and I forget we can use that dimension for any hero cards. I'll have to give it a go. TFS. I really like the 'cut off' effect on the rosette! and use of vellum! Love the bunting!! 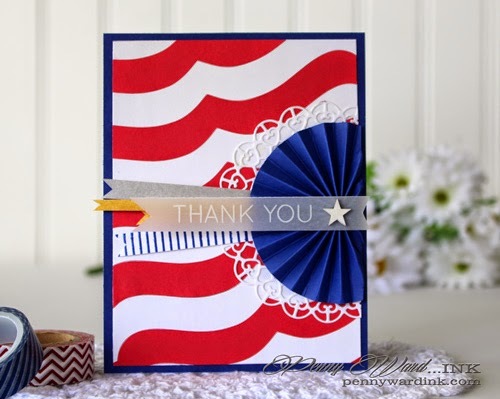 What a fantastic way to use it and the doily...a very patriotic card. Love this card--esp the rosette. Adorable! Love the doily and medallion. 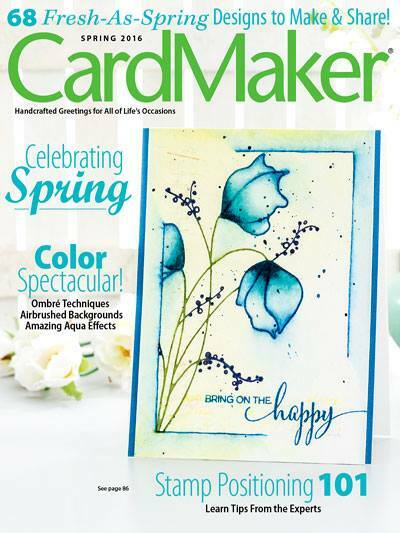 The scalloped background is perfect for your card. What an amazing card - love the details and that background is beyond awesome!! What a great thing for you to be a part of! !